NEW YORK (CNNMoney) -- The city council of Harrisburg, Pennsylvania, voted to file for bankruptcy protection Tuesday night. But the mayor of the state's capital, as well as the governor and a state senator, quickly called the action illegal. State law prohibits the city from filing for bankruptcy, they said. The filing "has no force and effect," Robert Philbin, a spokesman for Mayor Linda Thompson said Wednesday, adding the council has no authority to hire a lawyer on behalf of the city or file bankruptcy documents. "Rather than wasting precious time on illegal filings and engaging expensive attorneys, the majority of city council should be...working with the mayor and the commonwealth to resolve this crisis," said State Senator Jeffrey Piccola. But the council's attorney, who filed the documents in federal court in Harrisburg Tuesday night, said the council does have the power to file for bankruptcy. Mark Schwartz argued that the state law has "lots of problems," citing a section that says if a city does seek bankruptcy protection, it will lose its state aid. That implies a city can file, he said. City Council President Gloria Martin-Roberts did not return calls seeking comment. The vote was 4 to 3 in favor of the bankruptcy. Harrisburg's financial turmoil dates back 10 years, when the city decided to upgrade a trash incinerator, counting on revenue from the project to cover the cost of financing it. Instead, it has left the city crushed under $310 million in debt. The situation at the state capital, with just under 50,000 residents, has grown more bleak over time. And that has set up a battle, with the mayor and state officials on one side, and the city council on the other. The mayor, who took office last year, has strongly opposed bankruptcy, calling it an option of last resort. Thompson has turned to the state for help several times. A year ago the Pennsylvania state government gave the city $4.3 million to help stave off a bankruptcy threat at that time. The mayor also petitioned the state last year to enter its distressed municipalities program, known as Act 47, which prompted a state consultant to come up with a recovery plan. However, the city council this summer rejected the state's plan, as well as a similar proposal drawn up by the mayor. Despite that rejection, Thompson is moving ahead with her proposal, which calls for selling the incinerator and leasing the city's public parking lots. Those measures, along with some consolidation of city departments and givebacks from city employee unions, should put Harrisburg back on sound financial footing in two years or so, Philbin said. Offers to buy the incinerator have come in as high as $150 million. The mayor's plan also calls for increasing property taxes, with the typical homeowner paying an additional $50. Harrisburg, however, could soon end up under state control. The senate next week is scheduled to vote on taking over the city. The governor would then appoint a receiver, who would be advised by a committee made up of the mayor, city council president and appointees of the governor and the county. City council members have said they have little faith in the state. Four members wrote a column in the local paper, the Patriot-News, on Tuesday that argued that the state's plans "overestimate the revenues and underestimate costs and liabilities in general" and would leave the city in worse financial shape down the road. 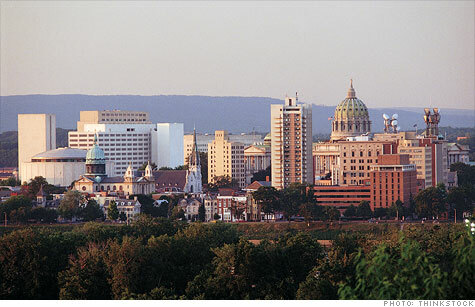 "Harrisburg has a higher than normal rate of poverty, and these difficult economic times are making it worse. The taxpayers of our city will soon reach the saturation level in what they can pay," wrote the council members in the column. They said they would be looking to have $100 million or more in bonds forgiven to help solve the financial problems and would also seek a 1% sales tax.